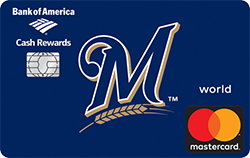 As a Milwaukee Brewers Mastercard new cardholder you enjoy 0% financing on purchases for the first 12 billing cycles. The rewards continue with the World Mastercard from Bank of America giving you a point or more for every dollar spent anywhere Mastercard is accepted. Show your support for the Milwaukee Brewers this season and be rewarded in return for your loyalty by applying here and selecting the Brewers as your team. Be very careful about this card. Especially if you’re saving up points to make a big purchase (which I’ve been doing). Your points will expire, and they won’t be very nice about it when you call to inquire and complain. In other words, you’re screwed. Most every other card I’ve ever had do not steal your points back from you as long as you’ve you’ve been actively using the card. Not these guys. Bank of Americas gets a big fat zero, and a zero – minus in customer service. And if anybody with the Brewers monitors these comments, why are you allowing this? Certainly your loyal fans deserve much better do they not?